This is to report back from a workshop recently held at the Boline Centre and Stockholm Resilience Centre on different disciplinary perspectives on the Sustainable Development Goals (SDGs). 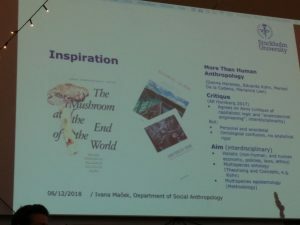 Speakers were invited from the areas of social anthropology, social-ecological systems, life sciences and environmental humanities to reflect on their work in relation to the SDG’s and potential new collaborations. So it was very much on humans, their interactions, their embeddedness in the environment and how we would make sense from destructive processes emerging on the global level, such as climate change. Since their announcement in December 2015, the SDG’s inspired policies on multiple governance levels, there is however no blueprint for their successful implementation. So we discussed to which degree this is actually desirable or when and where we have to think and act beyond the SDG’s. By interacting with scholars from so diverse multi-disciplinary cultures, we were actually experimenting how those lenses help us not only deconstructing but also constructing sustainable lifestyles. From the social anthropological perspectives, it was emphasized that the role of local knowledge towards SDG targets is completely unclear. Tomas Cole presented a case study on Burmese slash and burn agroforestry, ‘on their terms with their terms’, where from the distance this practice may be seen as a culprit but locally the external pressures are pushing people away from traditional, sustainable practices and putting their lives at risk. 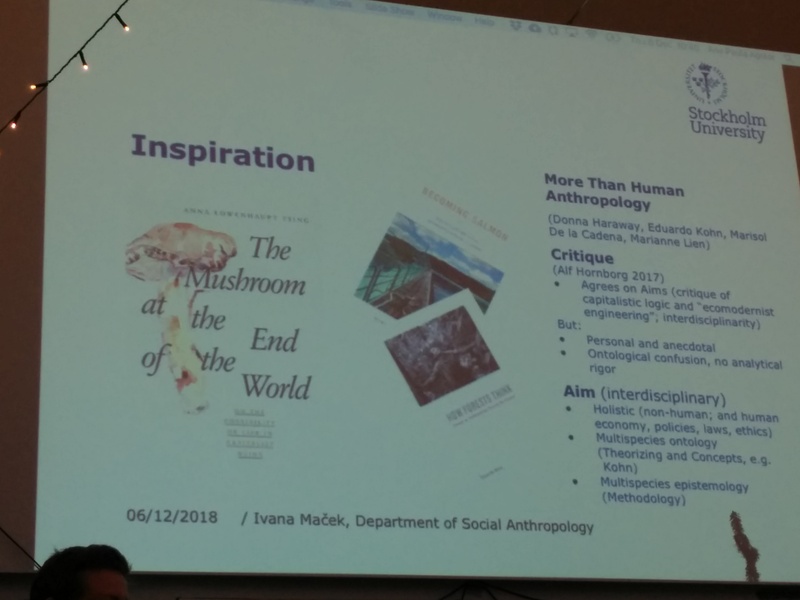 In another presentation from Ivana Macek, we learned about Oyster fisheries at the Swedish west coast and how the labeling of ‘invasive species’ and biodiversity loss relate to the language of genocides and the moral dilemma: How ok is it to employ a culture of killing? This calls for multi-species ethics. Later we discussed the more-than-human perspective nowadays growing again in social anthropology. Ivana Macek on social anthropology. Top-down policies vs. bottom-up realities – how to translate in between? Which entities do have or should be respected as having agency? One example was from New Zealand – the recent granting of personhood rights to a river which was enforced by the Maori people. The multi- and trans-disciplinary discourse or multiple evidence approach – how do we develop synthesis without loosing out on disagreements? Where are the shifting baselines we should take deliberate control over? Deep time – the far past and the far futures – our relation to time and how we can go beyond the sense of increasing urgency? How can we become good ancestors? Several paths depart from these questions and circle around the codewords of agency (multi-species), time and scale, and baselines to understand better what is behind the SDG’s and how they are not an end in itself but a means to enable human life on earth at least some centuries more. I see our group work on social-ecological feedbacks, acting on different time scales and across temporal and spatial scales, very much embedded in these discussions and a potential tool to tackle the complex issues at hand. Finally, I would like to thank Ivana Macek from the Dept. of Social Anthropology and Ana Paula Aguiar, research fellow at the SRC, for organizing this inspiring get-together with hopefully follow-up events next year. ← Research visit: Agent based model of norm migration between groups.